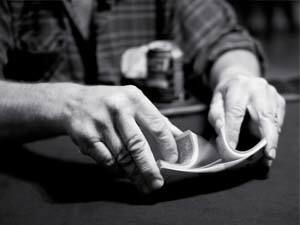 Cards shuffle is a process of mixing cards during the gambling game. There are a lot of ways to shuffle cards. Some of them are very easy to learn while others require good understanding of technique and time to develop these skills. Riffle Shuffle is the most common card shufflers techniques. A riffle is breaking a deck into two approximately equal parts and interleaving one into the other: the top part of cards is in the left hand and then cards are in-shuffled from left and right hands. In-shuffle changes into out-shuffle thus the sequence of the deck changes correspondingly. This kind of shuffling is also called the Faro shuffle. Here the subtype of riffle should be mention - the table riffle shuffle. It is rather easy method that can be performed even by any average player. The difference between those two is only the manner (or is it better to say place) of performing - the simple riffle involves only hands while table riffle is impossible without table. The table riffle shuffle is often used by casino dealers as well as riffle one. Actually, more often both of them are used in combination with so-called strip shuffle. Thus, we have a riffle-riffle-strip-riffle. Many dealers riffle more than three times and strip more than once. The situation when the casino employee riffle less than three times and doesn`t strip is very rare. This technique requires some practice but as the result it can be performed brilliantly and each card can come from another hand. First of all, take the deck and break it into two equal parts. Hold the deck with your ring finger and middle finger on the top, hold the other side of the deck with the thumb, your first finger goes on the back so you can push on cards. Make sure that your hands are close enough to each other so the thumbs almost touch each other. Then put your hands with cards on the table and riffle the cards together. This is the moment where the most of people stop their shuffle, it is easy - push two parts together. Then repeat this first procedure but bend the half-divided deck upward with your thumbs on top and then release it a little bit. As your hands separating you`ll have that's cascading waterfall effect. You can practice to improve your new skill!